BROOKLYN, N.Y., Jan. 15, 2019 (GLOBE NEWSWIRE) -- INDOCHINO, the global leader in custom apparel, is opening its first Brooklyn showroom at 161 Court Street on January 18, 2019. This is its first of up to 20 showrooms to open in 2019 and the fourth in New York, the fast-growing made to measure retailer’s largest market. The global leader in custom apparel, is opening its first Brooklyn showroom at 161 Court Street on January 18, 2019. This is its first of up to 20 showrooms to open in 2019 and the fourth in New York, the fast-growing made to measure retailer’s largest market. /EIN News/ -- The spacious 2,500 square feet showroom is situated in the trendy Cobble Hill neighborhood. Its diverse selection of longstanding independent shops, contemporary brands and international retailers makes it Brooklyn’s prime shopping district and the ideal location for INDOCHINO, which is reimagining how a generation shops and builds out their wardrobe. The showroom offers a highly engaging experience, personalized for every shopper. Upon arrival, customers are paired with an expert Style Guide who walks them through hundreds of high quality fabrics and endless complimentary customizations. Armed with an iPad, they design their custom garments, which are then made to their precise measurements and shipped directly to their door within two weeks, hassle free. Custom suits and overcoats start at $399 with chinos and shirts from $79, giving customers access to the superior quality and fit of tailored clothing at a price comparable to ready-to-wear. To celebrate the launch, every customer who steps into INDOCHINO Brooklyn and purchases a suit during the first two weeks will receive one free custom shirt or one pair of chinos. The offer expires on January 31, 2019, and customers can book their appointment here: www.indochino.com/showroom/brooklyn. This is INDOCHINO’s 39th showroom in North America, complementing New York’s Madison Avenue, SoHo and Financial District locations. In the wider Tri-State area, the retailer has a location in Short Hills, with showrooms in Greenwich, Manhasset and Paramus confirmed to open in 2019. Bialow Real Estate represents INDOCHINO in all of its U.S. real estate. Customers take on the role of designer, picking out every detail of their garments to make them truly one-of-a- kind. These are made to their precise measurements and shipped directly to their door, hassle free. 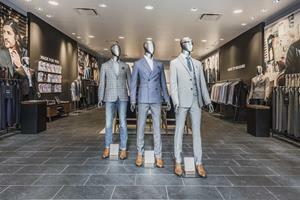 The company’s omni-channel approach allows them to shop online or in person at any INDOCHINO showroom.